Located on a hill overlooking the St. Lawrence River, Quebec City is the capital city of the Quebec province. With its colonial history and interesting culture, this French-style city has become a popular tourist destination, attracting over 6 million people every year. Not only is Quebec City renowned for its tourist attractions, it is also famous for hosting various events and festivals all year round. Quebec City’s joyful inhabitants, as well as its French lifestyle, have converted the city into one of the world’s must-see destinations. Here is some travel information that will be useful if you are considering a trip to Quebec City. High season in Quebec City runs from late May to mid September, as these months provide milder temperatures. February weekends are also pretty busy during Quebec City winter carnival (Carnaval de Québec). Quebec City is usually colder than Montreal and summer tends to be hot and humid. July and August are the warmest months of the year, with average temperatures of 23°C (74°F). Despite the cold temperatures, winter can also be a nice time to visit Quebec City, as the city provides easy access to lots of sport activities and the world-famous winter carnival during this season. Old Quebec (Vieux Québec): Included on the UNESCO World Heritage list in 1985, Quebec City’s Old Townis the historic part of the city and was founded by Samuel de Champlain in the early 17th century. Discover the narrow streets of this French-style neighborhood and take a tour in one of the horse-drawn carriages. Château Frontenac: Overlooking Old Quebec, this Disney-style castle (also known as Fairmont Le Château Frontenac) is actually a grand hotel designed by American architect Bruce Price and renowned as the most photographed hotel in the world. The Citadel: Quebec City being the only fortified city in North America, the Citadel is one of the most impressive and popular attractions. Visiting Quebec City’s fortifications is also one of the best ways to learn about the city’s military history. Battlefields Park (Parc des champs de bataille): This outstanding park, which groups together the Des Braves Park and the Plains of Abraham, is a historic place where many battles between the French and the British took place. It was created as a tribute to both French and British combatants. Dufferin Terrace (Terrace Dufferin): Built in 1838, the Dufferin Terrace is located next to the Château Frontenac and offers spectacular views over the Old Port,the South shore, Ile d’Orléans and the Château Frontenac. Rue du Trésor: The Rue du Trésor (which literarily means “Treasure Street”) is an outdoor gallery where artists exhibit their work in the open air. The street has become a popular attraction where tourists can buy souvenirs and enjoy outdoor exhibitions. 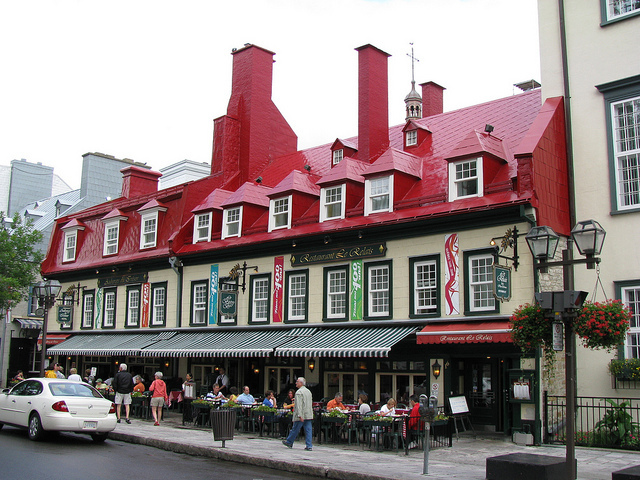 Petit Champlain: Petit Champlain is a district of Quebec City located near Place Royale. Take a look at the breath-taking architecture of this old commercial district and make sure to see the main street called Rue du Petit Champlain. One of Quebec City’s most unique attractions is the Ice Hotel (Hôtel de Glace) which was first opened on New Year’s Day in 2001 and operates every year from the beginning of January to the last week in March. The entire structure with walls of up to four feet is made of ice, and the beds (made of ice as well all the other furniture) are lined with deer furs, feature mattresses and Arctic sleeping bags. Drinking glasses and plates are also made of ice. The chapel of the Ice Hotel has been described as one of the “10 dream wedding locations” of the world. The New France Festival (Fêtes de la Nouvelle France): This festival celebrates the arrival of the first European settlers on American soil and features various shows and activities that take you back to the 17th century.The festival is held at the beginning of August. Quebec City Winter Carnival (Carnaval de Québec): Held in February, the Winter Carnival is one of the most popular events in Quebec City. The activities include snow slides, ice sculptures and outdoor shows. Bonhomme, the cheerful snowman, is the popular ambassador of the Quebec City Winter Carnival. Crashed Ice, sponsored by Red Bull, is an extreme sporting event held most years in Quebec City that involves downhill skating on a special course with lots of steep turns and high drops in the city’s historic downtown area. This high-adrenaline competition involves four competitors descending at one time and has been described as a mix of hockey, downhill skiing and snowboard cross. Montmorency Falls: Located 11 kilometers away from Quebec City, the Montmorency Falls (Chute Montmorency) are an 85-meter high waterfall located in the Montmorency Falls Park (Parc de la chute Montmorency). Public buses run from Quebec City to the Falls. Ile d’Orléans: Ile d’Orléans (Orleans Island) is an island located 5 kilometers east of Quebec City. It is a really nice destination for people willing to enjoy the countryside and taste some local artisans-made delicacies. Whale-watching: Whale-watching is definitely something you have to experience before leaving Quebec City. Bus tours are organized from Quebec City and take you to Baie Sainte-Catherineor Tadoussac where you can take a glimpse of these impressive mammals. With its rich colonial history, French-style cafés, lively events and joyful inhabitants, Quebec City is definitely worth a visit. You will experience European architecture and joie de vivre in a North American setting. Vist our website for travel advice, interviews and first-person travel adventures.